It shames me to think that I could barely remember a time when classic syndicated game shows were a regular part of my evening TV viewing. Perhaps my personal favorite of those major shows had been “Jeopardy!”, and its quirky gimmick of “giving your answer to the clue in question form” that has been its primary draw ever since it started in 1964. Come to think of it, my actual first encounter with “Jeopardy” was in videogame form, namely the PC-DOS version on floppy from 1987 that I saw a classmate playing back in 6 th Grade. I feel so old. But I don’t have to elaborate further on the popularity of the show that people from all over would like to appear as contestants there. One of these lucky people was 41-year old science content developer Cindy Stowell of Austin, Texas. She really wanted to get in the show, in hopes of winning some prize money to donate to her favored charities. Stowell got her wish alright, but sadly according to The Daily Mail, she won’t get to watch herself competing on television. The reason has been hanging over her head for the past few years: cancer. And a mere week more before her taped episode was scheduled to show, Stowell finally lost her personal battle. The road to competing in her favorite show was a long and involved process for Stowell. She’d passed the “Jeopardy!” online contestant exam way back in 2012 and was quick to make contact with the show’s producers during her in-person auditions, revealing to them her doctor’s prognosis that she didn’t have much longer to live. When she finally got her shot at the game, which was taped this September, she was actually in poor physical shape from a blood infection-induced high fever. She spent the show enduring the pain with painkillers, her fellow contestants completely unaware. 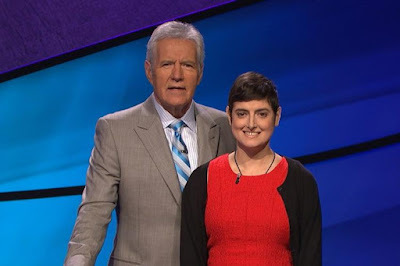 Stowell had asked that any winnings she would get from the show were to be donated on her behalf to charities involved in cancer research. Her parents Greg and Carole along with Hess made mention of this fact in a joint statement, adding that Stowell was happy to be able to make a contribution so that “no one else would have to go through what she did”.